Caché provides object technology by means of the following object classes: %Library.RegisteredObject, %Library.Persistent, and %Library.SerialObject. The following figure shows the inheritance relationships among these classes, as well as some of their parameters and methods. The names of classes of the %Library package can be abbreviated, so that (for example) %Persistent is an abbreviation for %Library.Persistent. Here, the items in all capitals are parameters and the items that start with percent signs are methods. A registered object is an instance of %RegisteredObject or a subclass. You can create these objects but you cannot save them. The other two classes inherit from %RegisteredObject and thus include all the parameters, methods, and so on of that class. A persistent object is an instance of %Persistent or a subclass. You can create, save, open, and delete these objects. A persistent class is automatically projected to a table that you can access via Caché SQL. The following chapter discusses persistent classes in detail. A serial object is an instance of %SerialObject or a subclass. A serial class is meant for use as a property of another object. You can create and delete these objects, but you cannot save them or open them independently of the object that contains them. When contained in persistent objects, these objects have an automatic projection to SQL. Via the classes %DynamicObject and %DynamicArray, Caché also provides the ability to work with objects and arrays that have no schema. These classes are not discussed in this book. For details, see Using JSON in Caché. You can create an object (an instance of a class). To do so, you use the %New() method of that class, which it inherits from %RegisteredObject. You can define properties in any class, but they are useful only in object classes, because only these classes enable you to create instances. You can validate that the property values comply with the rules given in the property definitions. All objects inherit the instance method %NormalizeObject(), which normalizes all the object's property values. Many data types allow different representations of the same value. Normalization converts a value to its canonical, or normalized, form. %NormalizeObject() returns true or false depending on the success of this operation. All objects inherit the instance method %ValidateObject(), which returns true or false depending on whether the property values comply with the property definitions. All persistent objects inherit the instance method %Save(). When you use the %Save() instance method, the system automatically calls %ValidateObject() first. In contrast, when you work at the routine level and do not use classes, your code must include logic to check the type and other input requirements. You can define callback methods to add additional custom behavior when objects are created, modified, and so on. In realistic scenarios, this callback might perform some required initialization. It could also perform logging by writing to a file or perhaps to a global. It is helpful to be able to recognize this error. It means that the variable is not an OREF but should be. There is only one way to create an OREF: Use a method that returns an OREF. 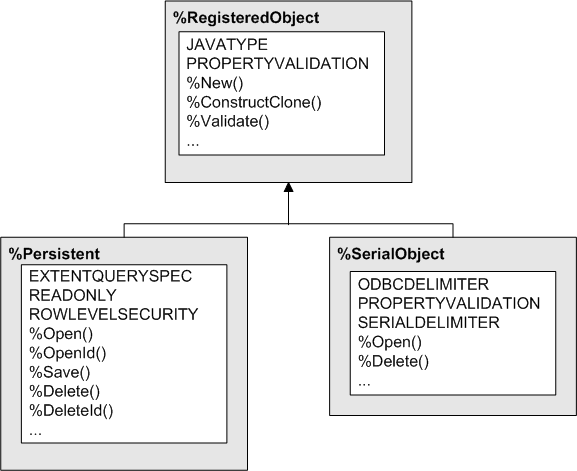 The methods that return OREFs are defined in the object classes or their subclasses. You can determine programmatically whether a variable contains an OREF. The function $IsObject returns 1 (true) if the variable contains an OREF; and it returns 0 (false) otherwise. For persistent classes, described in the next chapter, methods such as %OpenId() also return OREFs. You can use stream fields with Caché SQL, with some restrictions. For details and a more complete introduction, see Using Caché Objects; also see the InterSystems Class Reference for these classes. The %Stream.FileCharacter and %Stream.FileBinary classes are used for streams written to external files. The %Stream.GlobalCharacter and %Stream.GlobalBinary classes are used for streams stored in globals. To work with a stream object, you use its methods. For example, you use the Write() method of these classes to add data to a stream, and you use Read() to read data from it. The stream interface includes other methods such as Rewind() and MoveTo(). Write "this stream has this many characters: ",mystream.Size,! Write "this stream has the following contents: ",! When you need a container for sets of related values, you can use $LIST format lists and multidimensional arrays, as described earlier in this book. If you prefer to work with classes, Caché provides list classes and array classes; these are called collections. %Library.ListOfDataTypes  Defines a list of literal values. %Library.ListOfObjects  Defines a list of objects (persistent or serial). %Library.ArrayOfDataTypes  Defines an array of literal values. Each array item has a key and a value. %Library.ArrayOfObjects  Defines an array of objects (persistent or serial). Each array item has a key and an object value. You can also define a property as a list or array. If Classname is a data type class, then Caché uses the interface provided by %Collection.ListOfDT. If Classname is an object class, then it uses the interface provided by %Collection.ListOfObj. If Classname is a data type class, then Caché uses the interface provided by %Collection.ArrayOfDT. If Classname is an object class, then it uses the interface provided by %Collection.ArrayOfObj. The other functions are useful in similar scenarios. Name: Van De Griek,Charlotte M.
With no argument, this function returns the class name of the current context. This can be useful in instance methods. Using Caché Objects describes how to define classes and class members in Caché. Caché Class Definition Reference provides reference information for the compiler keywords that you use in class definitions. The InterSystems Class Reference, which is introduced later in InterSystems Class Reference, provides details on all non-internal classes provided with Caché.